Neutrik Multimedia Connectors | PRO MUSIC, s.r.o. Due to the rising digitisation the interface problems between audio/video networks, IT equipment, MP3 camcorders, etc. increase. A rugged solution is needed. 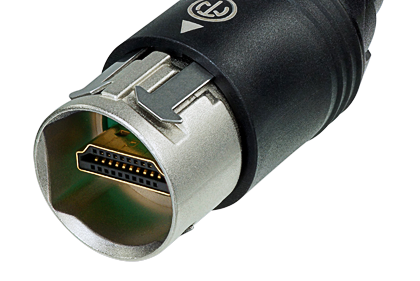 Neutrik's reversible USB gender changer, mounted in the standardized D-shape housing, and the rugged patch cables solve this problem. Neutrik's HDMI solution for the transmission of any digital TV and PC video format including high-definition video (HDTV) can be integrated in networks very easy. The series includes a chassis connector in the standard D-size housing and rugged HDMI patch cables. Due to the rising digitisation the interface problems between audio/video networks, IT equipment (e.g. Mac) and mLAN connections increase. Neutrik's Firewire feedthrough type 1394a, mounted in the standardized D-shape housing, solves this problem. Neutrik's D-SUB feedthroughs in the standard D-shape housing are ideal for audio networking and integration of equipment into video systems.